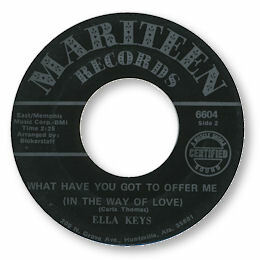 This is the only 45 by Ella Keys that I know but its one that grows better with each play. What Have You Got To Offer Me is a version of a Carla Thomas track issued as Stax 195. But this is a more subtle piece of music in which Ella shows a disarming vulnerability in her rather gentle vocals – you can imagine her having her heart broken and I think that fear is behind her pleading. The orchestration suits the mood of uncertainty very nicely with the subdued horn horns coming in occasionally to add weight to the organ, piano and guitar all of which are very well played. A lovely delicate winner from Huntsville, AL. PS ~ I really love the faux sticker on the label "Certified - A Muscle Shoals Sound".